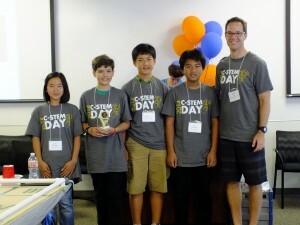 The 4th C-STEM Day was held on May 31, 2014. 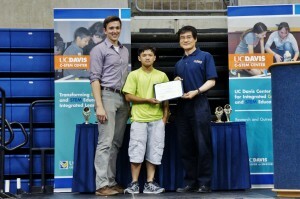 This year it was expanded to two locations: UC Davis and UC Irvine. 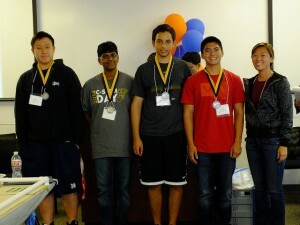 The 2014 C-STEM Day was organized by the UC Davis Center for Integrated Computing and STEM Education (C-STEM). 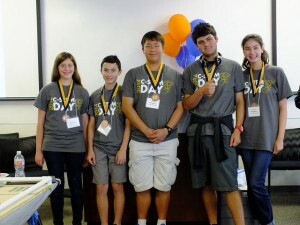 The C-STEM Day at UC Irvine was co-organized by Coastline ROP. 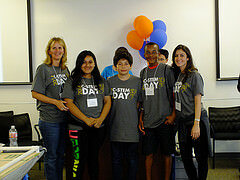 C-STEM Program Manager Heidi Espindola coordinated the C-STEM Day at UC Davis site and Merry Kim at Coastline ROP coordinated the C-STEM Day at the UC Irvine site. 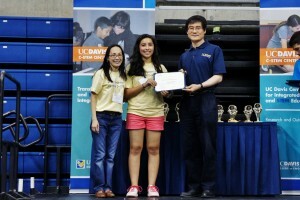 Enrique Lavernia, Dean of the College of Engineering of UC Davis and C-STEM Center Director Harry Cheng welcomed all participants including students, teachers, parents, judges, and volunteers at UC Davis Pavilion. 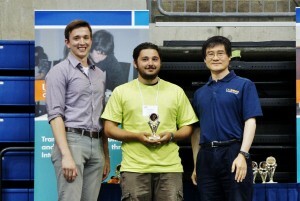 Under leadership of HP engineer Rex Schrader (Chief Judge for RoboPlay Competition), Roger Nattkemper (Volunteer Coordinator), and Intel C-STEM Volunteering Project Coordinator Srinivas Modekurty, more than 40 HP and Intel volunteers as well as volunteers from other companies at the UC Davis location served as judges for the RoboPlay Challenge Competition and the Math Programming Competition. 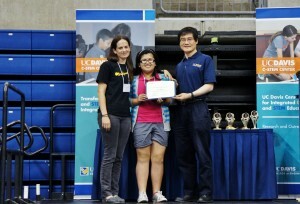 Professor Debra Richardson, Founding Dean of Donald Bren School of Information and Computer Sciences at UC Irvine welcomed all participants at the UC Irvine site. 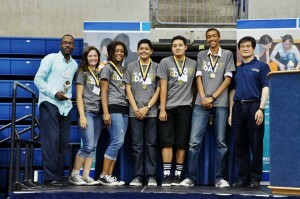 A total of 35 student teams participated in the RoboPlay Challenge Competition, with 28 teams at UC Davis and 17 teams at UC Irvine. 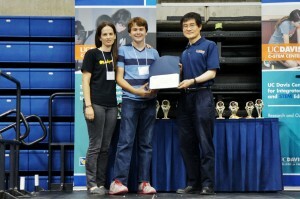 45 teams submitted their videos for RoboPlay Video Competition. 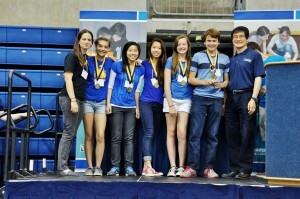 Congratulations to student teams from Orange County for their outstanding performance! 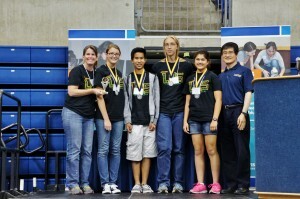 For their first time participation on the C-STEM Day, they won the 1st and 2nd places for statewide RoboPlay Challenge Competition for middle schools, and 1st, 2nd, and 3rd places for statewide RoboPlay Challenge Competition for high schools. 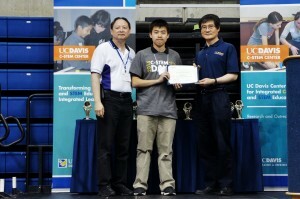 The event at UC Irvine was well summarized below by Chris Harrington, Head Judge for RoboPlay Challenge Competition at UC Irvine, a former Vice President for Toshiba American Information Systems. 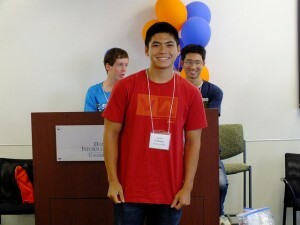 “Speaking I feel for all of us who were “first timers” at Orange County site, the day was amazing. 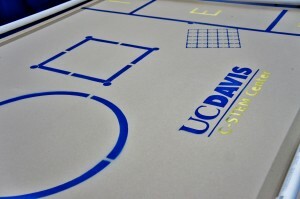 We saw teams “bounce back” after disappointing starts, leaders “take command” as the clock ticked, students and their teacher jumping in unison at a score, and some very competent teams that almost always knew exactly what to do. 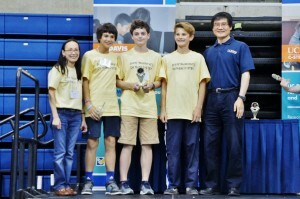 Obviously, technical skills in programming the bots was the official contest, and I think it teaches very well basic engineering values of achieving goals with precision and accuracy, under time constraint, and sometimes against unpredictable obstacles. 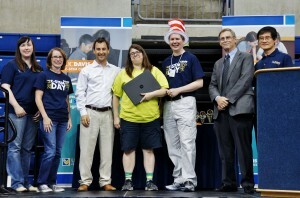 As I said in my opening remarks, luck – good and bad – always shows up at competitions, invited or uninvited! 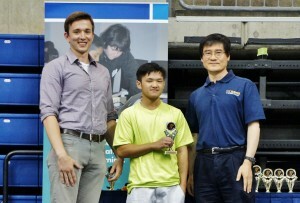 The Judge Awards, in my opinion, are a superb complement to the technical scoring. We all know that “soft skills” are important in business, so recognizing those attributes gives stronger context to the competition. 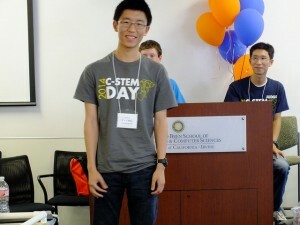 Finally, the video competition certainly added an artistic dimension, entering the realm of C-STEM.” Click here for a video about the C-STEM Program in Orange County. 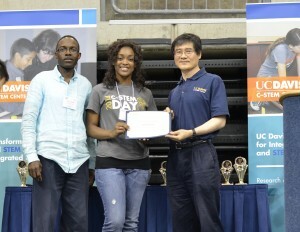 The C-STEM Day was concluded with the awards ceremony for students. 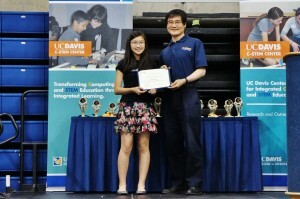 Professor Harry H. Cheng, Director of the C-STEM Center presented various awards to students participating at the UC Davis site for their exceptional work in C-STEM education and winners of the competitions. 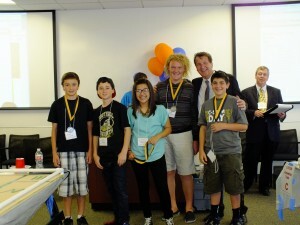 HP Manager Collette Adams presented the donation of a full class set of HP laptops each to district representatives, principals, and C-STEM teachers at the School of Engineering and Sciences in the Sacramento City Unified School District and Elkhorn Village Elementary School in the Washington Unified School District at West Sacramento for their expansion of the C-STEM program. These two C-STEM schools with a large number of socially and economically disadvantaged students have successfully integrated the C-STEM program into their teaching and are in great need of computers for implementation and expansion of the program. 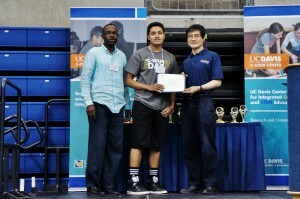 The Sandia C-STEM Scholarship sponsored by Sandia National Labs were presented to graduating seniors at both UC Davis and UC Irvine sites. 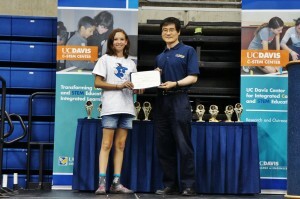 Professor Debra Richardson at UC Irvine and Superintendent Darlene Le Fort of Costline ROP presented the awards to students participating at the UC Irvine site. 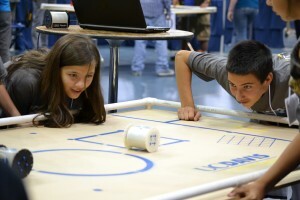 RoboPlay Competition is an open-ended design challenge. 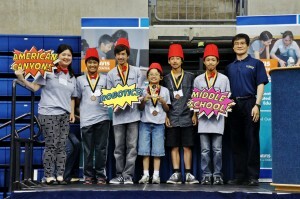 The goal of the RoboPlay Competition is to broaden student participation in computing, science, technology, engineering, and math (C-STEM) education with positive development for all students. 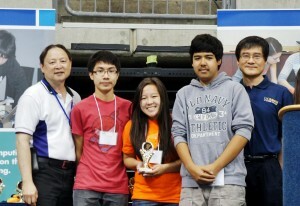 There are two categories for RoboPlay Competitions: RoboPlay Video and RoboPlay Challenge. 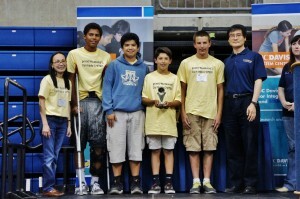 The RoboPlay Video Competition is completed within the classroom and submitted online. 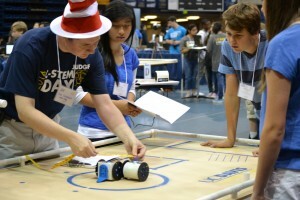 The RoboPlay Challenge Competition was held on the C-STEM Day. 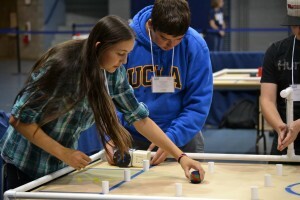 These robot competitions are open-ended design challenges that integrate math and computer programming with art, music, choreography, and design for practical real-world problem solving. 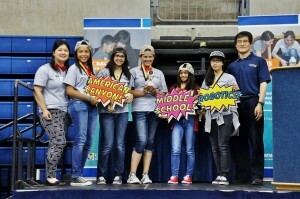 RoboPlay Challenge Competition The RoboPlay Challenge Competition is designed for K-14 students to showcase their real-world problem solving skills in a competitive environment. 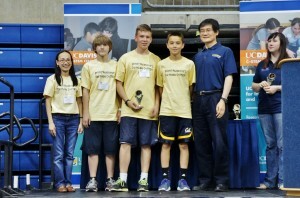 This competition simulates an unexpected problem occurring at a remote location such as a space station or planetary habitat, where a robotic solution must be quickly developed and deployed, using only existing resources. 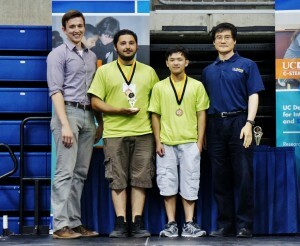 The competition challenges students to creatively use modular robots and accessories to complete various tasks. 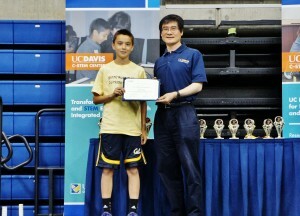 The competition arena and specific challenge will be kept secret until the day of the competition. 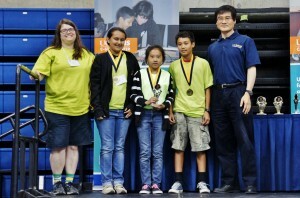 Using their math, programming, and problem solving skills, students try to most efficiently get the highest score for each task. 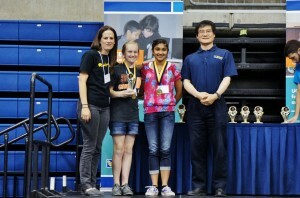 More pictures for 2014 RoboPlay Challenge Competition. 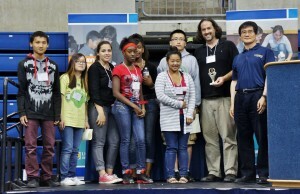 RoboPlay Video Competition RoboPlay Video Competition is designed for K-14 students to play with robots while exploring their creativity in writing, art, music, choreography, design, and film making and at the same time seamlessly learn C-STEM subjects. 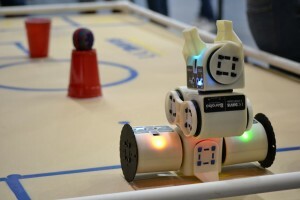 The handling of robot coordination between multiple modules and music requires not only teamwork in designing a well-organized visual performance but also the math and programming skills to produce the desired actions for robots. 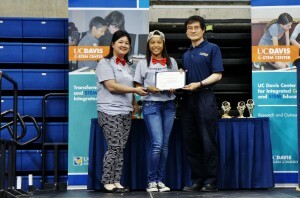 The competitions will enable students working in different interest groups to explore the basic concepts of C-STEM in conjunction with their artistic and music talents. 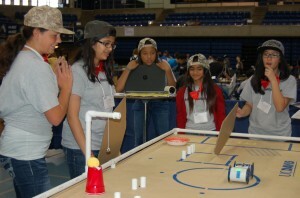 To participate in the RoboPlay Video Competition, students create a video showcasing the unique capabilities of Linkbots and Mobots. 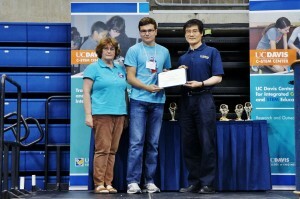 The Math Programming Competition provides students in secondary schools with the opportunity to apply their fundamental computer programming skills for applications in mathematics. 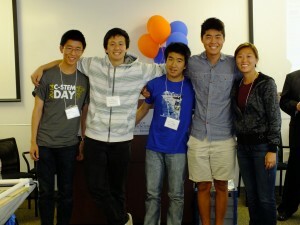 Being the gatekeeper to STEM careers, mathematics is necessary for all secondary school students. 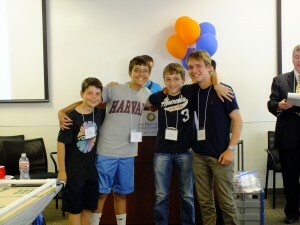 This competition challenges students to apply their programming skills to solve math problems at the levels of Pre-Algebra and Algebra 1. 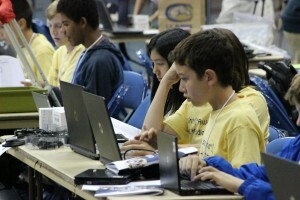 Students will use structured programming in C, including basic programming concepts such as variables, math expressions and operators, selection statements, and loops for computer-aided math problem solving. 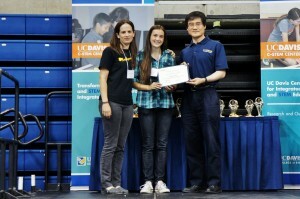 The C-STEM Awards recipients were nominated by their teachers or school administrators and selected by the C-STEM Awards Committee consisting of UC Davis faculty, graduate students, and undergraduate students. 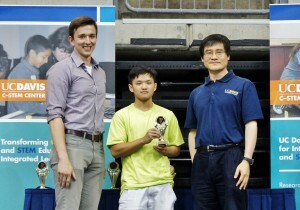 Four types of C-STEM awards were presented at the ceremony. 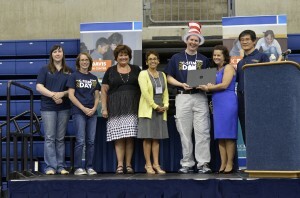 HP Laptop Donations HP Manager Collette Adams presented the donation of a full class set of HP laptops each to district representatives, principals, and C-STEM teachers at the School of Engineering and Sciences in the Sacramento City Unified School District and Elkhorn Village Elementary School in the Washington Unified School District at West Sacramento for their expansion of the C-STEM program. These two C-STEM schools with a large number of socially and economically disadvantaged students have successfully integrated the C-STEM program into their teaching and in great need of computers for implementation and expansion of the program.